Did you know that work-related illnesses affect double the amount of people as injuries? Musculoskeletal disorders, stress, respiratory conditions, skin disorders, hearing loss, back pain, the list is long and it’s costing UK businesses a fortune, as well as affecting the lives of over 1 million people. In 2014/15 alone, work-related illness cost businesses £9.3 billion, almost double the cost of injury (£4.8 billion). Last year, work-related illness and injury combined, resulted in 30.4 million working days lost! These startling statistics make it shockingly clear that managing health, should be just as important as safety. 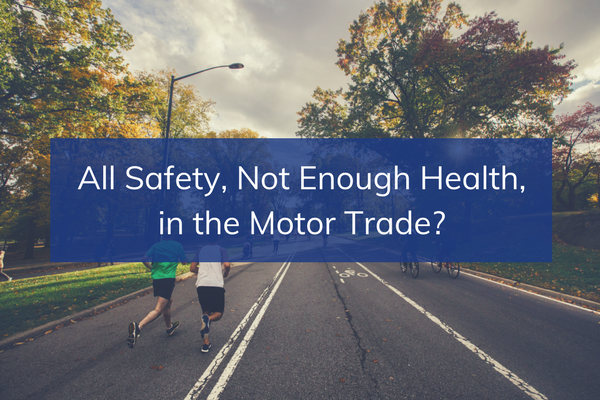 In this article, we are going to share how businesses in the motor trade can create a positive culture around health and wellbeing and provide practical advice relating to hearing loss and hand-arm vibration syndrome (HAVS). Is health the poor relation to safety in your business? 1. Do you struggle to engage your teams in health and wellbeing? 2. Are you seeing increasing issues with hearing loss and hand-arm vibration syndrome (HAVS)? 3. Are you concerned about, or experiencing, fines and fee for intervention related to health issues? If the answer to any of these questions is yes, then read on. It’s vital to make your board interested in health and wellbeing for change to become a strategic objective for the business. This can be a challenge as the impact of improving health and wellbeing is not always certain or immediate. However, as the old saying goes, “what gets measured, gets done”, so provide your board with a compelling story, backed up by statistics, to demonstrate the personal and business benefits. The excellent online resources from the IOSH No Time To Lose campaign will help you make your case. • Train people to understand the immediate risks of bad practice, but also the future consequences on their lives and those of their loved ones. For example, when training people on the risks of repetitive strain injuries, give context on how it could affect both their work and family life in the future. • Make designing and developing wellbeing campaigns a collaborative process to get workforce buy-in. This creates a community environment around health and is more likely to lead to cultural change. • Find out if you still have a problem. Complete exposure sampling for noise and vibration, including personal dose as well as equipment measurements. • Using medical surveillance results and the above sampling, put in place person specific risk assessments and control measures. • Provide easy to follow information for your technicians about the effects of noise and vibration and explain the measures you have in place to protect them. Use film, photographs and other media for clear communication. • Keep records. It goes without saying that the HSE will expect to see very clear physical and written evidence that you have the right control measures in place. • Technology now makes it easy to monitor the potential for both noise and HAV exposure in real time. Some solutions now offer wearable technology, paired to the employee, rather than just attached to the plant or equipment. • Ensure that more than one person at each site has knowledge of and access to, all the evidence of your health programmes, should an HSE inspector call. Protecting the health of your people now and in the future, is not only morally the right thing to do, it will also lead to a reduction in lost work time and an increase in productivity. Not to mention protecting your business from costly action from regulators and expensive insurance premiums. With that in mind, it’s no surprise that successful organisations pride themselves on the health and wellbeing of their workforce.